A company which started out with just one aircraft and one pilot, GSL Aviation now runs five aircraft, and a whole team of professionally trained commercial pilots. Offering scenic flights and transfer services throughout the beautiful Whitsundays, the company operates seven days a week from its base at the Whitsunday Airport. The views from the air make this is the best way to see the vastness of the reef and the islands. Take to the skies in a six seater Cessna 210 or one of the eight seater GA8 Airvans (don't worry they're not campervans with wings) for views of the beaches, the coral and maybe even whales and dolphins down below in the ocean. These aircraft have been designed with high wings and undercarriages. This means they can take off and touch down on less than perfect landing strips, it also means that if you're taking photographs there are no obstructions from the windows, just the very best vistas. The 'Island Explorer' lives up to its name. This is the best way to experience the amazing views of the Whitsundays - Hill Inlet and one of the top beaches in the world, Whitehaven Beach. Window seats are guaranteed, there's no need to worry about that, and whist you sit back and relax, you'll watch as the Whitsundays unfolds in front of your eyes. The most popular of all GSL Aviation's flyovers is the 'Reef and Island Flight'. It takes in all the best parts of the local islands, and that includes Whitehaven Beach and Hill Inlet. 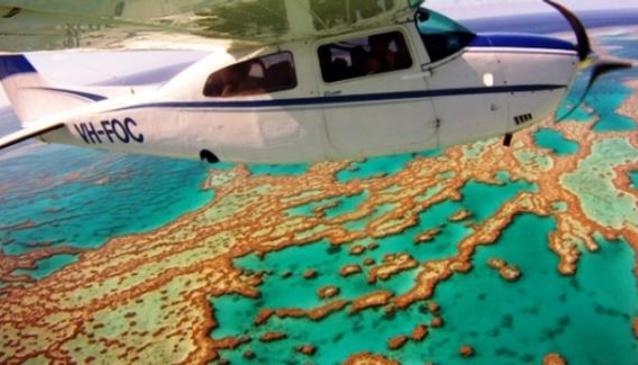 Next you fly over one of the Seven Natural Wonders of the World, The Great Barrier Reef, and witness the breathtaking Heart Reef (which can only genuinely be appreciated from the air), you also see Bait Reef, Hardy Reef and Hook Reef. The one-hour flight operates several times a day and is always a firm favourite. It's not just departures from the Whitsunday Airport, GSL Aviation also offers a 'Bowen Reef Adventure' which, as the name suggests, operates from Bowen. This 1.5-hour flight offers views of Gloucester Island National Park and Hayman Island, the choice of celebrities. The aircraft turns out for the Great Barrier Reef and Bait Reef, Hook Reef and the beautiful Heart Reef. On the return, the flight isn't complete without a flyover of the world famous Whitehaven Beach and Hill Inlet and then Airlie Beach, before heading back past Hideaway Bay to Bowen. The newest additions to the tours are the Fly 'n' Cruise Packages. This is where you can have the best of both worlds, seeing the reef from the air, and then taking to a boat where you enjoy time on and under the water. With scenic flights, fly and cruise options and island transfers to Hamilton Island, GSL Aviation is definitely a full service aviation company at the heart of the Whitsundays.